Some software used to search the Web for images marked with a digital watermarks. This was supposed to help discover both authorised and unauthorised uses of protected works. This is what Imagelock was doing: downloading pictures from the Internet, computing a digest (also called a ‘fingerprint’ by Imagelock people) of then and comparing this digest with digests registered in its database. The attack works because copyright marking methods have difficulties to embed watermarks in small images (typically below 100×100 pixels). The bandwidth available for embedding is too small. 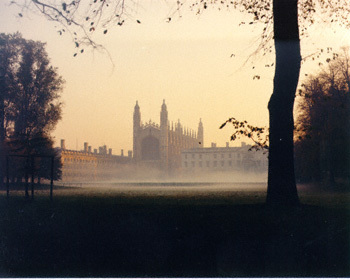 King’s College Chapel, courtesy of John Thompson, JetPhotographic, Cambridge. In some cases downloading the mosaic is even faster than downloading the full image! In this example we used a 350x280-pixel image watermarked using Digimarc's PictureMarc 1.51. More advanced tricks can be used to bypass such ‘crawlers.’ Java applets, ActiveX controls, etc. can be used to display the picture inside the browser. As Scott Craver, IBM Research, suggested to me, the applet could even de-scramble the picture at the request of the user. Here is a rough example of what could be done. Many features could be added, such as de-scrambling, option for saving, etc. The only solution for the watermark checker is to render the web page in memory, detect where the pictures are and check whether they contain a mark. It is obviously very expensive (CPU time). One could also imagine that the web server ignores systematically the requests from the crawler or, as it is actually often the case, that the images are on a web server whose access is controlled (users need to register and pay a subscription). There was an article about this latter problem in the New-York Times. These examples show that automatic checking does not prevent malicious users from displaying copyrighted pictures illegally on their Web page. Currently, only a manual/human check can deal with this problem. 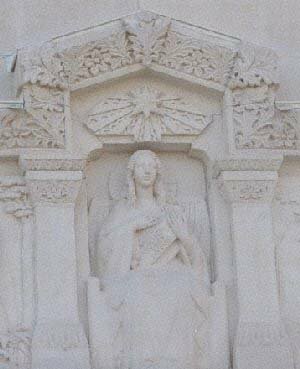 Copyright © 1995, Fabien A. P. Petitcolas – Detail of a sculpture on the north facade of Notre Dame de Fourvière Basilica in Lyon, France. Picture watermarked using the maximum strength of Digimarc’s software, i.e. level 4 (thanks to Scott Craver).